We know procrastination from the inside out. Between us, we have been through many all-nighters, spent years struggling with our doctoral dissertations, paid late tax penalties, and made up elaborate stories to excuse our delays. Now, we consider ourselves mostly-reformed procrastinators. In 1983, our book was turned in two years past the deadline. This 2008 edition required only a 6-week grace period! We began working with procrastinators in 1979 when we were on the staff of the Counseling Center at the University of California at Berkeley. We devised the first procrastination groups in the country for college students, and we began to offer Procrastination Workshops to the general public and to organizations and corporations including Levi Straus, Stanford University, Lawrence Livermore Labs, among others. We have appeared on Oprah and 20/20 and have been interviewed in the New York Times, USA Today, Newsweek, and the International Herald Tribune. 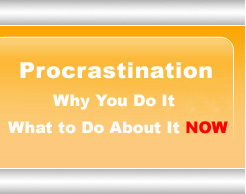 As psychologists in private practice, we have worked individually with procrastinators for thirty years. Hearing their stories, understanding their struggles, and helping them progress has been one of the great joys of our professional lives. Jane B. Burka, Ph.D. is a psychologist and psychoanalyst in private practice in Oakland, CA. 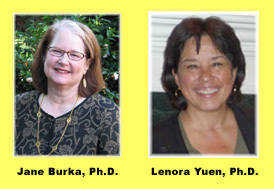 Lenora M. Yuen, Ph.D. is a psychologist in private practice in Palo Alto, CA. While we understand that people are often anxious for help, we cannot offer advice to individuals via email or telephone. We can only offer our thoughts and suggestions in the context of in-person consultation.